Dooky Chase's Restaurant is a New Orleans, Louisiana institution. Its Chef, Leah Chase, is an icon. Known as "The Queen of Creole Cooking," Chef Chase has been in the kitchen at Dooky Chase's since shortly after she married the restaurant founder's son, jazz musician Edgar Dooky Chase Jr., in 1944. The restaurant was one of the few places where black and white patrons could dine together in segregated New Orleans, and it soon became a place for Civil Rights Movement leaders to meet and strategize. Everyone from Martin Luther King, Jr. to Thurgood Marshall dined at Dooky Chase's, and (as we learned in our interview) Chef Chase even brought her food to jailed Freedom Riders after their arrest for protesting the segregated interstate bus system. 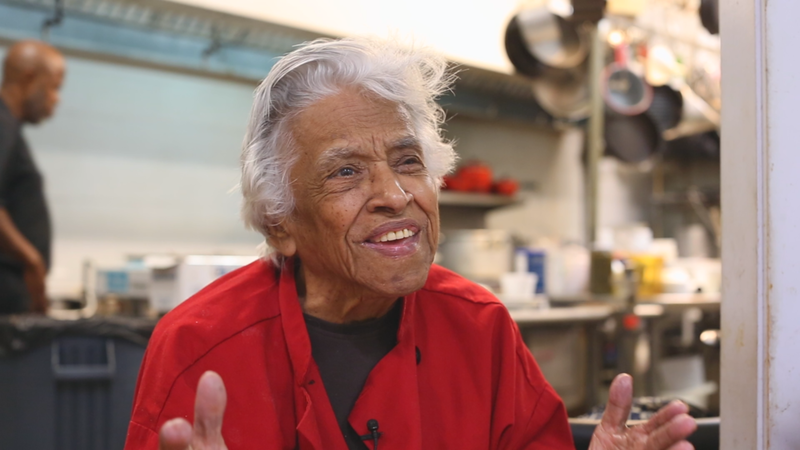 Today, Dooky Chase's remains one of the finest restaurants in the country, and the 94 year-old Chef Chase is still at the center of it all, cooking her iconic Creole dishes. We were (and still are) in awe that we got to speak with the James Beard Lifetime Achievement Award-winner on our recent visit to her restaurant. She sat down with us for nearly an hour in the middle of her busy kitchen, keeping an eye on each dish that went out the door as she taught us about her career, her popular fried chicken, and the roots of her legendary cuisine. From the outside, The Old Country Store Restaurant may seem like little more than the quiet old general store that gave the building its name. But upon entering the spacious dining hall (filled with plenty of leftover knick-knacks from its general store days) and meeting the charismatic owner Arthur “Mr. D” Davis, you’ll understand why locals, tourists, and celebrity chefs travel long distances to Lorman, Mississippi to taste the “heavenly fried chicken” made by this self-proclaimed “Chicken Cooking King.” We spoke with Chef Davis when we made the trip down Highway 61 last year, eating copious amounts of his chicken as he told us the story of his establishment and demonstrated the hospitality that has made him famous. Lolis Eric Elie is an award-winning writer, filmmaker, and historian from New Orleans, Louisiana. He is the author of Treme: Stories and Recipes from the Heart of New Orleans and Smokestack Lightning: Adventures in the Heart of Barbecue Country (as well as the writer and co-producer of a documentary film based on the book). He is also the editor of Cornbread Nation 2: The Best of Southern Food Writing. Mr Elie's work as a journalist has appeared in newspapers and magazine across the country, including the New Orleans Times-Picayune, the New York Times, the Washington Post, the San Francisco Chronicle, Gourmet, and The Oxford American. His work also extends to television, as he has served on the writing staff for the AMC show Hell on Wheels, HBO's Treme, and was co-producer and writer of the PBS documentary Faubourg Treme: The Untold Story of Black New Orleans. Mr. Elie was kind enough to take time out of his (obviously) busy schedule to speak with us about fried chicken and its history in New Orleans. According to Elie, his favorite fried chicken can be found at Willie Mae's Scotch House. "Willie Mae's fried chicken was a revelation to me...the crust at Willie Mae's fried chicken has always struck me as something of the ideal," he said. Martha Lou Gadsden’s iconic status is evident even before you walk in the door of Martha Lou’s Kitchen, her restaurant in Charleston, South Carolina. The restaurant’s bright-pink exterior, covered with murals of Chef Gadsden and Charleston’s scenery, reminds passersby that she has been serving America her popular soul food classics for “over 30 years.” Though she shows no sign of slowing down at age 87, her daughters Debra Worthy and Lillie Mae Gadsden join her in the kitchen and ensure that this family business never misses a beat. We spoke with Lillie Mae Gadsden on our visit to Charleston and learned more about Martha Lou Gadsden's history and her renowned fried chicken. Edward Lee is James Beard Award-nominated chef, author, and restauranteur. He is the owner of several restaurants in Louisville, Kentucky and Washington, DC, including 610 Magnolia and Succotash. Lee is the author of the cookbook Smoke and Pickles: Recipes and Stories from a New Southern Kitchen, which highlights his innovative cuisine–a unique blend drawn from his Korean-American heritage, his childhood in New York City, and his life cooking in the American South. Lee has also recently announced a forthcoming book of food essays and travel stories titled Buttermilk Graffiti: A Chef's Journey to Discover America's New Melting Pot Cuisine. In addition to his work as a chef and author, Lee also starred as the host of Season 3 of PBS's cooking show Mind of a Chef, and has appeared on a variety of other shows including the Travel Channel's Bizarre Foods and the Food Network's Chopped and Iron Chef America. Chef Lee was incredibly generous with his time and invited us to join him at the first of his two DC-area Succotash locations, educating us on the techniques of cooking fried chicken and explaining how "fried chicken was able to conquer the world." Adrian Miller is the James Beard Award-winning "Soul Food Scholar," an author and historian from Denver, Colorado. He is the author of Soul Food: The Surprising Story of an American Cuisine, One Plate at a Time, as well as the recently-published The President's Kitchen Cabinet: The Story of the African Americans Who Have Fed Our First Families, from the Washingtons to the Obamas. Mr. Miller spoke with us in Washington, DC to teach us about how fried chicken arrived and thrived in America, as well as how the dish "quickly became a meal associated with Sunday Church suppers." Dr. Frederick Douglass Opie is a Professor of History and Foodways at Babson College, and the author of several books, including Hog and Hominy: Soul Food from Africa to America and Southern Food and Civil Rights: Feeding the Revolution. He is also the host of two podcasts, The Fred Opie Food Show and the Fred Opie Show, the latter of which is a sports-focused podcast drawing on Dr. Opie's experience as a highly accomplished lacrosse player for Syracuse University and the US National Team. We are very grateful to Dr. Opie for sitting down with us and giving us a lesson on the origins and history of fried chicken in America. Bertha's Kitchen in Charleston, South Carolina is a true family business. More than 35 years after it was founded by the late Albertha Grant, the restaurant is run by her three daughters, Julie Grant, Linda Pinckney, and Sharon Grant Coakley, who manage the kitchen and ensure that everything on the menu lives up to their mother's exacting standards. Their success is evidenced by the line of customers trailing out the door on our recent visit, eager to try the family's versions of low country classics like okra stew, turkey prioleau, and fried chicken. The fame of these dishes has spread well beyond Charleston, as Bertha's was recently named a James Beard Foundation "America's Classic" and one of Eater's 38 "Most Essential" American Restaurants for 2017. We spoke to Linda Pinckney about her mother’s legacy and what this recognition (from both local customers and the national media) means to their family. Emelyn Rude is a Cambridge, England–based historian and author of the book Tastes Like Chicken: A History of America's Favorite Bird. Her food and travel writing has been published in Time, Vice, First We Feast, Refinery29, and DCist, among others. Rude is also the editor of EATEN, a quarterly print food history magazine. New Orleans's Willie Mae's Scotch House was founded as a bar in 1957. Then it was a barber shop. Then a beauty salon. By the 1970s, it had transformed itself yet again into a restaurant where Chef Willie Mae Seaton was cooking the legendary fried chicken that would win her restaurant a James Beard Award as an “America’s Classic” in 2005. Though it was severely damaged by Hurricane Katrina, Willie Mae's Scotch House survived (with help from our interview subject Lolis Eric Elie and the Southern Foodways Alliance) and is still serving the fried chicken that earned the late Chef Seaton the title “the Goddess of Fried Chicken.” We spoke with Kerry Seaton-Stewart, Ms. Seaton’s great-granddaughter and the current manager of Willie Mae’s, on our recent visit to sample some of their award-winning fried chicken. The Senator’s Place is, in fact, a Senator’s place. Located just off Highway 61 in Cleveland, Mississippi, this soul food restaurant is owned and operated by Mississippi State Senator Willie Simmons. Sen. Simmons' restaurant has been a Cleveland institution since its opening in 2003 (even hosting Anthony Bourdain for the "Mississippi" episode of Parts Unknown), and he was kind enough to invite us into his kitchen and speak with us about what his restaurant's famous fried chicken means to him and the community. Nicole Taylor is a Brooklyn-based multimedia storyteller and cookbook author. She is the author of the Up South Cookbook, and has contributed pieces to the New York Times, Savuer, the Bitter Southerner, First We Feast, Cherry Bombe, Civil Eats, Travel Noire, the Undefeated, and Gravy Quarterly, among others. Ms. Taylor also hosts the podcast Hot Grease. Ms. Taylor graciously invited us into her home to give us a cooking demonstration, and her fried chicken (pan-fried in lard) was some of the best we've ever tasted.